In Japan’s lore, yokai are malevolent supernatural entities often created by the returning spirit of a human or animal to been wronged in life seeking revenge. However, even undying love may give rise to an undead creatures. When a woman dies still desiring to stay with their family or lover, her spirit manifest into a hone-onna. This yokai will appear as a young, beautiful woman disguising her true form of a rotten walking corpse or skeleton. In legends, the hone-onna is a ghost which returns wanting to continue the love of those she had in life. She would arise from the grave at night and return to the home of her family or lover. The yokai’s suddenly appearance would shock those grieving her passing, yet be joyous of the woman’s return unaware of her true nature. Myths mention, even hone-onna may not even be aware herself of what she transforming into. In lore, unsuspecting husbands or lovers would often fall victim to this yokai. The hone-onna visited the male at night to engage in intimacy where she feed’s off their life force then leaving in the morning. This course of action usually resulted in the man’s death. Only those strong in will or of could see pass the disguise and maybe able to intervene. Often in stories, man who been warned of the hone-onna still continued to embrace the ghost, even at the cost of their lives. 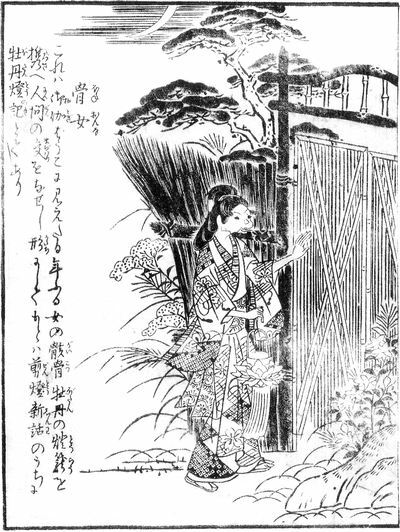 Hone-onna, in several myths, continue to exist long after killing their lovers. Either a wish to continue living or be embraced by someone, these yokai carry on appearing at night seducing young men and sustaining themselves by extracting their life force. In some forms of Japanese media, the hone-onna been the setting for tragic love stories. The homne-onna is indeed a unique legend. There are a few stories about this yokai going back centuries. I’ll see on posting them in the near future.